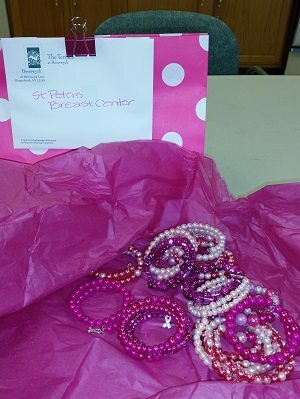 Helen Lettko, together with four fellow residents of The Terrace at Beverwyck, earlier this month made and donated breast cancer awareness bracelets for patients of the St. Peter’s Hospital Breast Center. 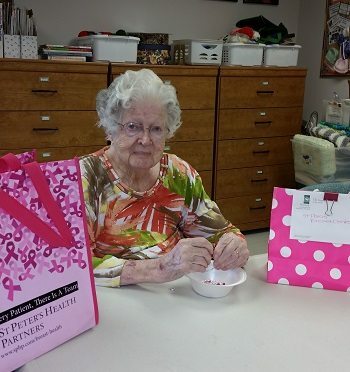 Lettko, 93, is a breast cancer survivor herself. For the next project, she and others plan to make and donate crocheted hats for cancer care patients. Many thanks to Ms. Lettko and the other Beverwyck Terrace residents for their compassionate, thoughtful gift!